The Australian Jesuits have this week announced the first details of their Bookends Project, outlining a process where members of the Province community will be invited into deeper engagement with Aboriginal and Torres Strait Islander peoples. The Bookends Project was announced in July, committing the Province to redoubling its efforts to promote reconciliation with the country’s First Peoples and its most recent arrivals – refugees and asylum seekers. 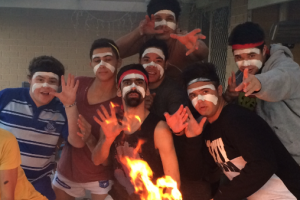 Students from St Ignatius’ College Riverview engage in Yarning Circles around a fire. Anastasia Moore was appointed as a project officer for the Aboriginal and Torres Strait Islander component of the project, and has been undertaking a consultation process with Province ministries over recent months, including an all-day workshop with Province delegates and ministry representatives on 19 September. Australian Provincial Fr Brian McCoy wrote a letter to Province ministries this week, announcing a three-stage strategy for the project. ‘Participants in the (September) workshop were very firm in their view that any Province-wide reconciliation plan must begin with opportunities for everyone in the Province, Jesuit and lay, to meet Aboriginal people, listen to their experiences and share in spiritual conversation’, he said. Creating opportunities for members of the Province to engage with Aboriginal people, and circulating a brochure to the Province summarising the history of the Province’s engagement in this area and present involvement. Engaging minds and hearts to help inform people of the history of local Aboriginal peoples as well as their aspirations and priorities today. The sharing of experiences and relationships will be an ongoing journey. After the launch of the first two stages, ministry delegates and the boards of various ministries will be asked, ‘What can this ministry do to advance the Aboriginal component of the Province’s Bookends Project?’ The plan is to launch a series of projects and initiatives, large and small, that will be compiled, documented and monitored under the supervision of the Delegate for Social Ministries. Fr McCoy said that over the coming months, members of the Province should expect to see a number of initiatives, including storytelling from Aboriginal participants in various ministries, celebratory events coinciding with key dates such as NAIDOC Week, information packs on various topics, and videos and lectures for distribution. Anastasia Moore says one of the main aims of the project is to ensure that people across the Province are working together on these issues and asking themselves what they can do to contribute to reconcilation. ‘Many people are committed to reconciliation with Aboriginal and Torres Strait Islander peoples, but they not always sure what’s the right way forward. This project aims to offer some clarity to people around the Province, and provide a way that we can collaborate and move forward together’, she said. For more on the Bookends Project, visit http://jesuit.org.au/the-bookends-project/.